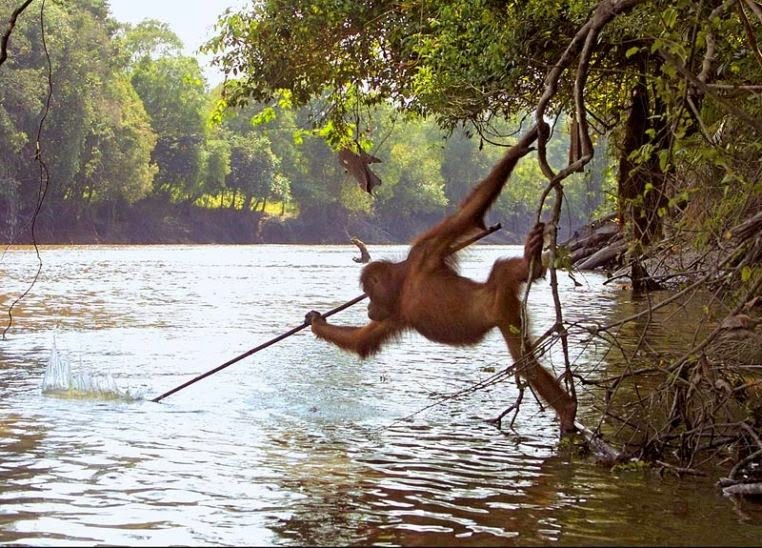 Just came across this extraordinary photo, taken by Gerd Schuster co-author of Thinkers of the Jungle: The Orangutan Report, showing an orangutan spearfishing in Borneo. Apparently, the orangutan had witnessed some of the locals fishing with spears and attempted to do the same, albeit with not much success. Monkey see, monkey do.. This individual had seen locals fishing with spears on the Gohong River. Although the method required too much skill for him to master, he was later able to improvise by using the pole to catch fish already trapped in the locals’ fishing lines." The book also reports that the orangutans were able to swim across a local river to get food. This is notable since it has been widely believed that orangutans can walk in water but can't swim. Of course, this is not the first recorded incident of tool-use by Orangutans, or primates in general. The species was first observed using tools in the wild in 1982 - by anthropologist Biruté Galdikas - in wild Bornean orangutans in the Tanjung Puting National Park. In Borneo, there have been sightings of orangutans using handfuls of leaves as napkins to wipe their chins while orangutans in Sumatra have been seen to use leaves as gloves, helping them handle spiny fruits and branches, or as seat cushions in spiny trees. There have also been reports of individuals, both in captivity and in the wild, using tools held between the lips or teeth, rather than the hands. Orangutans in captivity have been taught to chip stone hand-axes.